Calendar shows all the tasks in a workspace. You can view tasks by month, week, or day. Clicking a task in the calendar opens it in detail view. In the panel at the upper-right, click the Tasks. A list of tasks appears. At the bottom of the Tasks tab, click the calendar icon . The calendar opens to the current month. Click a task in the calendar to view its details. 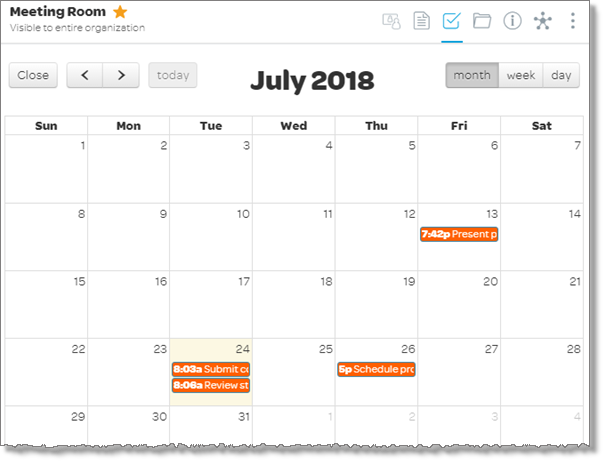 To narrow the focus of the calendar view, in the upper-right of the calendar, click week or day. To move the calendar view to the next or previous month, week, or day in the upper-left of the calendar, click the right or left arrows. To return focus to the current month, week, or day, in the upper-left of the calendar, click today. To close the calendar view, in the upper-left of the calendar, click Close.